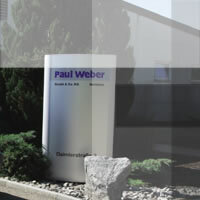 Paul Weber GmbH & Co. KG was formed by Mr Albert Weber at Gosheim in 1930. We have concentrated on and are specialists in manufacturing precision turned parts. Pius Weber and Patrick Weber are the present Managing Directors of out company. Expansion of production units "CNC-area". 2013 Expansion of production units "CAQ-area". Conformity evaluation in line with SpaEfV. 2006/ 2007 Introduction of the CAQ system. Purchase of 3K scanning measuring machine. Construction of new precision measurement laboratory. 2003/ 2004 Setting up of an environment management system in line with DIN EN ISO 14001. DIN EN ISO 9001:2000 and VDA 6.1 .
takes over the management of the company. DIN EN ISO 9002:1994 and VDA 6.1. Managing Directors Paul Weber and Pius Weber. Paul Weber, son of the founder of the company, takes over the management. Relocation of the company to Herrenzimmern.